New Session, New Leaders Emerge. House Majority Leader Amy Summers, didn’t initially picture herself as a delegate or even getting into politics. Summers, a Republican from Taylor County, works as an ER nurse and lives on an Angus cattle farm. Her father was involved in politics, serving as the Grafton mayor and chairman of the Republican party. Summers has been involved in American Cancer Society initiatives and was part of the “ban the tan” legislation to prohibit teens from using tanning beds. Summers also mentioned Sen. Patricia Rucker, R-Jefferson, who was selected to lead the Senate Education Committee. Rucker is the first Republican woman to lead this committee. Summers praised Rucker’s selection for the committee. Sen. Donna Boley, R-Pleasants, also said she was excited to see Rucker selected to chair the Education Committee. Boley has seen much change since she was first appointed to the West Virginia Senate in 1985. Boley is the president pro tempore. She previously was the minority leader in the 70th, 71st, and 72nd Legislatures and at one point in time was the sole Republican in the Senate. Boley, like Summers, didn’t picture herself in the Legislature. She previously was chairwoman of the Republican Party in Pleasants County. After the governor appointed a state senator to fill a circuit judge vacancy judge in Pleasants County, Boley found herself on a short list of possible replacements to fill the Senate seat. “As of May 14, I will have been here 34 years,” she said, noting by that time, she will be the longest continuous serving senator. Boley served on the judiciary until she became minority leader in 1991. She likes serving on the Finance Committee but says sometimes she misses Judiciary. Boley, who is the chairwoman of the Confirmations Committee, said a goal is for the committee to meet more often. For Boley, her favorite part about being a senator isn’t necessarily introducing or passing legislation. Her favorite part is helping constituents. She recalled various phone calls she’s received about issues affecting people back home, including issues with water lines or roads. Summers feels the same way, whether she’s working in the ER or in the Capitol. As of 4:00 p.m. Friday, January 18, 2019, the 10th day of the first regular session of the 84th Legislature, 354 bills have been introduced to the senate. Of those bills, nine have passed and have been sent on to the House for further consideration. Senate Bill 10 relates to Second Chance Driver’s License Program. The Program allows temporary reinstatement of an individual’s driver’s license that has been suspended or revoked to due failure to pay court fees as a result of a motor vehicle violation, or has failed to appear in court when charged with a criminal offense. Under the Second Chance Program, the DMV can temporarily stay a driver’s license suspension or revocation for individuals accepted into the programs if the individual remains current in the repayment of unpaid court costs as required by the established repayment plan. By providing that when a person is accepted into the program, the DMV coordinates with the courts to get a full accounting of all unpaid courts costs assignable to the applicant. By providing that 100% of payments received as repayments of affine, forfeiture, or penalty are sent back to the courts. Senate Bill 24 relates to local boards health. 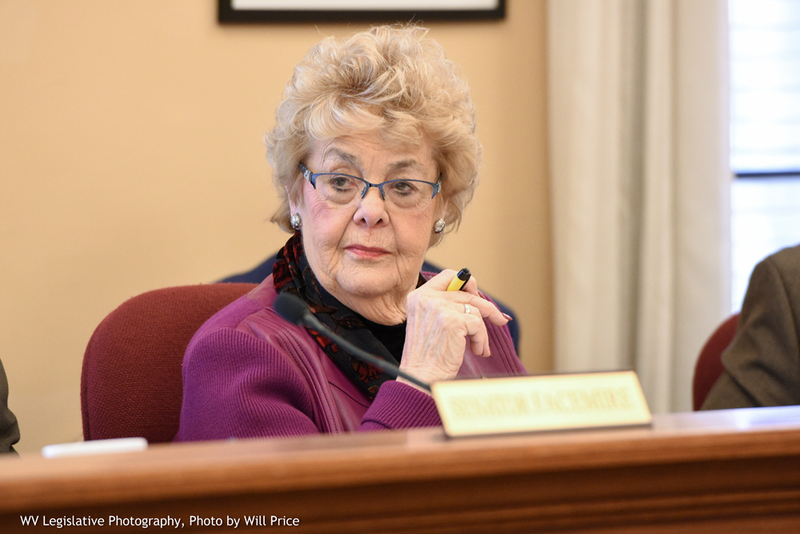 The bill would require the Legislature to include funding in the appropriation of the DHHR that must be used for pay raises for employees of local board of health when an across the board pay increase is provided for state employees. The bill would also require the funding be ongoing. Senate Bill 27 would remove current restrictions on where certain KENO themed lottery games may be played. Currently these games may only be played at locations that are authorized to sell alcohol. The bill would allow these games to be sold at all traditional lottery licensed retail locations. Senate Bill 28 would remove the current $200,000 limitation on the amount collectable by a county via the hotel occupancy tax that may be used for medical care and emergency services. Senate Bill 36 would provide protections for any person who retires under an employer-provided defined benefit pension plan. If that pension plan terminates prior to or after the retirement of that person and the pension plan is covered by a guarantor whose maximum benefit guarantee is less than the maximum benefit to which the retiree was entitled, the protection provided by the bill would be then put into place. If the Tax Commissioner determines that this adjustment reduces the revenue of the state by 2 million or more in any one year, then the Tax Commissioner must reduce the percentage of the reduction to a level at which the Tax Commissioner believes will reduce the cost of the adjustment to 2 million for the following year. Senate Bill 190 relates to a rule proposed by the State Personnel Board for a new pay plan for the division that allows salaried and hourly classified service employees to be compensated for hours worked after the accumulation of 40 hours for the work week, even if annual or sick leave was used during that time. The employee must occupy a position that is paid either premium or straight-time for overtime hours worked. The proposed rule has also been amended by adding the required sunset provision. Senate Bill 177 contains a proposed rule which amends a current legislative rule by adding a required sunset provision and by updating an energy efficiency standard for commercial buildings from the 2007 edition to the 2010 edition of the International Property Maintenance Code. Senate Bill 106 would provide for a tax credit for income taxes imposed by and paid to a foreign country. Senate Bill 272 would update code relating to Commission on Special Investigations. It would provide the Commission more backing, and adds more regulation on how the Commission conducts investigations. The bill specifies that the President and the Speaker are to be one of the members from each of their respective houses and that they are to serve as chairs of the Commission. The bill states that the investigative staff is to consist of a director, a deputy director, senior investigators and investigators approved by the co-chairs. The bill allows the commission to request rather than subpoena records for state, county, and local government entities. As of 4:00 p.m., Friday, January 18, 2019, the tenth day of the first regular session of the 84th Legislature, 522 bills have been introduced in the West Virginia House of Delegates. Of those bills, eight have passed and have been sent to the Senate for further consideration. House Bill 2164 would establish that each party heard in a West Virginia lower court would have the right to be heard and receive a document based on merits of appeal. This bill would require The West Virginia Supreme Court of Appeals to provide the option for heard parties to receive a written, meaningful review of merits. House Bill 2351 aims to streamline PEIA authorization documents. House Bill 2351 would establish an objective guideline for forms and deadlines that PEIA, managed care organizations, and private commercial insurers would abide by when it comes to prior authorization. House Joint Resolution 5 would make it possible in the state of West Virginia to list manufacturing equipment as a tax exemption. House Bill 2028 would limit supervision of laying lines on state rights-of-way. Currently, it is required that a state engineer must be present when a public service district lays water or sewer lines on state rights-of-way. Under the proposed bill, an engineer would not be required to be present for the full construction time. They would just be involved with initial and periodic inspections as well as inspection upon conclusion of the project. House Bill 2038 relates to the procedure to determine if an occupation or profession should be regulated. This bill says that if an unregulated occupation or profession in this state is regulated in less than 25 other states the proposal to regulated should be prohibited unless it is demonstrated that West Virginia is unique should be regulated. This bill also provides that the Legislative Auditor review the licensing of professions or occupations every 5 years and recommend sun setting the regulation if fewer than 25 states in the United States license and regulate that occupation or profession, unless it is demonstrated that the State of West Virginia is unique and should be regulated. House Bill 2128 would allow state employees to take paid leave to attend parent-teacher conference for their children. Employees are eligible each year for less than four hours of paid leave during normal work hours and no more than two mutually-scheduled conferences per child. The time taken will not be stricken against an employee’s annual or sick leave benefits. House Bill 2183 would clarify where a charge of DUI may be brought against an individual. Currently a DUI can be, statutorily, enforced against individuals operating a vehicle upon the roads of the state. This bill adds language that clarifies that DUIs may only be assessed against individuals operating a vehicle upon public highway or private road. It also adds that “private road” does not include private roads in any circumstances where the operator or driver is operating the vehicle on his or her own property and has not left, or does not intend to leave, said property to drive upon any public highway. This is intended to allow a driver to be arrested for a DUI if he or she has entered a parking lot or driveway or is about to leave a parking lot or driveway, but not under any other circumstances. House Bill 2185 relates to the removal of animals left unattended in motor vehicles. This bill allows an officer or “agent” to remove an animal from a vehicle with proper cause if they believe the animal is serious, life threatening danger or is in extreme suffering, physical injury, or deceased. The agent must leave a written notice in a secure and easily seen location on or in the vehicle bearing the officers name, title, and the address of the location where the animal may be retrieved. The owner may only retrieve it after all charges that have accrued for the maintenance, care, medical treatment, and impoundment have been paid or a payment plan have been made. House Bill 2307 relates to creating a provisional license for practicing barbering and cosmetology. This would remove the requirements to take an examination for a license to practice barbering and cosmetology in this state, by an applicant with a valid license from another state. The bill provides the board may issue a provisional license to an applicant with an expired license and authorizes the board to set the applicable fees for a provisional license and shall not exceed half the cost of a full license. House Bill 2203 would move the administration and registration process for contractors from the West Virginia Division of Labor to the jurisdiction of Chapter 30 of the Code of West Virginia. This would put West Virginia contractors under the same umbrella as other licensed state professionals such as architects and physicians. Contractors in West Virginia, under this bill, would have to follow licensing procedure similar to that of the forty-one occupations covered under Chapter 30 of the code. Contractors would be required to annually renew their licenses, report to an executive board, and have a certificate with a seal displayed openly in order to be a licensed contractor within the state. House Bill 2077 would establish penalties in the state of West Virginia for smoking in a vehicle with a child under the age of eight present. This bill would make smoking with a child present a secondary offense, punishable by a fine of up to $25. House Bill 2319 is a proposed new section to the Code of West Virginia that would permit the Bureau for Medical Services to create a wholesale importation program, where the state of West Virginia would be able to import more affordable pharmaceuticals from Canada available to West Virginia citizens for purchase. House Bill 2347 would require the Secretary of the Department of Health and Human Resources to either improve significantly or build new facilities at two hospitals in West Virginia. Hopemont Hospital in Terra Alta, WV, and Jackie Withrow Hospital in Beckley, WV, would be improved upon or added to under this bill. They would be made better equipped to provide long term care and substance abuse treatment to those in the state in need. House Bill 2311 is a proposed revision to how West Virginia citizens with short term licenses would have to report to the State Tax Commission. Currently, people in the state who receive a short term merchant license to sell beer, fireworks, or other miscellaneous merchandise can get a short term, 90-day license to sell these items. After their license has expired, these temporary merchants have to fill out tax information for the remainder of the fiscal year. This bill would stop requiring short-term licensees to fill out tax paperwork after their term is over and after they’ve paid all of their required fees. House Bill 2346 revises the licensure requirements for state casino workers. This bill would allow certain casino workers, such as service workers, to opt for a registration rather than a license. House Bill 2036 would allow vehicles with disabled veterans’ special registration plates park in spaces reserved for people with mobility impairments. This would allow those with disabled veterans’ stickers or plates to use those stickers and plates as an equivalent to the usual blue handicap signs. House Bill 2209 is a bill that would allow military veterans who have certain qualifications to qualify for examination for licensure as an emergency medical technician. If a service member obtains a Military Occupational Specialty (MOS) in a field related to that of emergency medical technician or combat medic, they can apply to test for an emergency medical technician license in the state of West Virginia. If they pass the examination, these individuals would not have to go through additional state training. House Bill 2223 would allow military personnel stationed in the state of West Virginia to be recognized as citizens of the state in order to obtain a concealed carry permit. Current statute requires those in the state of West Virginia to be citizens of West Virginia, and this bill would allow those stationed in the state to be recognized under this. House Bill 2330 is similar to House Bill 2209, but the occupations it would work to legislate for differ. If a service member obtains a MOS related to the fields of plumbing, HVAC operation, or fire safety installation, they can also opt to take the examination for state licensure without going through additional state training. 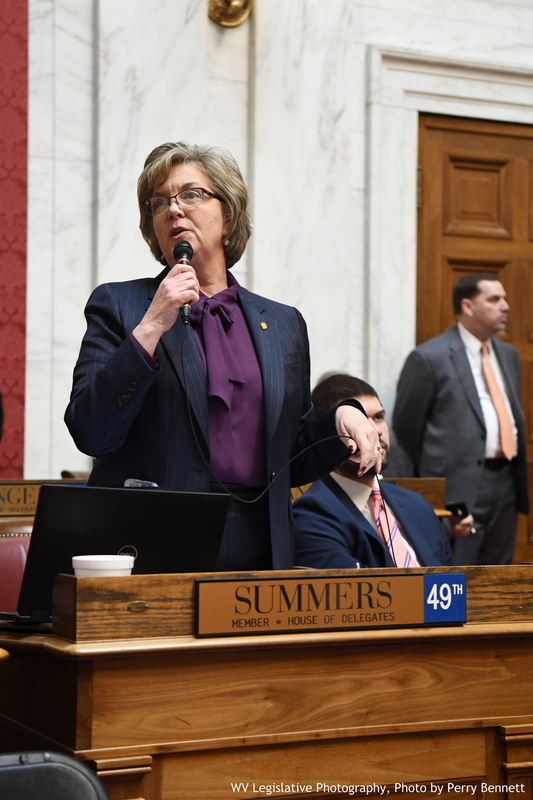 Majority Leader Summers Delegate Amy Summers, in her new role as Majority Leader, is the floor leader for the majority party in the House of Delegates and serves to communicate and promote the party’s position on issues before the House.